Welcome to the PRX page of Obama 2012, President Barack Obama's official re-election campaign. This page is maintained by the campaign's digital team. Dawn talks about what GOTV organizing is like for volunteers. At a special event in Charlottesville, Bruce Springsteen encouraged folks to get out the vote for President Obama. Listen to a few early voters explain why they cast their ballot for Barack Obama, and share this with anyone in your life who’s still undecided. Listen up: "Barack Obama made me proud"
After Vice President Joe Biden knocked it out of the park in the vice presidential debate, supporters called in to let him know what they thought. 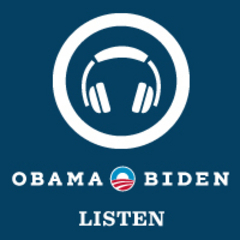 A three-part audio series featuring Obama 2012’s efforts to make sure everyone has a chance to cast a ballot this fall.